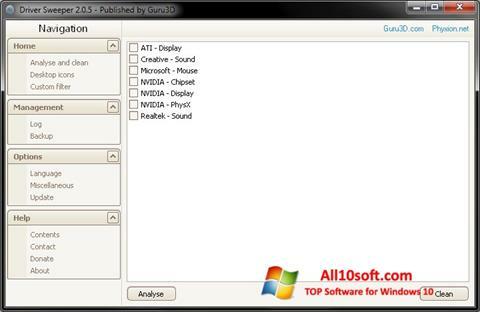 Driver Sweeper for Windows 10 - Compact utility for cleaning the system after removing the drivers. The application allows you to scan the system files and the Windows registry, can find temporary data, residual keys and records that can cause failures when installing or updating software versions. The utility is capable of deleting unused files, it can create a backup before uninstalling and is able to undo a committed action. The program uses an intuitive graphical interface and a step-by-step wizard, runs from any media and consumes a minimum of RAM. You can free download Driver Sweeper official latest version for Windows 10 in English.